The new psychology is foreshadowed in the lives of the great peace activists who have gone before us. We can learn from them as they traveled the road that we must take in the struggle to abolish war. I have taken a case history approach and chosen the lives of ten great peace activists to analyze. For the most part I have been inductive and let their autobiographies speak for themselves about important psychological issues. But, like any psychologist, I bring certain tools and theoretical approaches to the work. In previous studies, I have developed this approach through studies of other autobiographies, oral histories of local peace activists, statistical analysis of why students become peace activists, studies of the physiology and psychology of motivational systems, and study of the general principles of activity psychology as it was developed in the Soviet Union (footnote 2). Also, I am a peace activist myself, and have studied the history of American peace movements (footnote 3). In deciding which ten peace activists to choose, I have concentrated on Americans and sought a broad range of activists who rose to leadership from the various peace constituencies. Because my audience is primarily the U.S. peace movement, I have chosen our fore-runners in particular. They represent the broad range of the U.S. peace movement. There are five women and five men. Four were Nobel Prize winners, three of whom won the Nobel Prize for Peace. There is the remarkable Eugene Victor Debs, who received almost a million votes for President while confined to prison for opposing World War I. There are heros of the movement to end the war in Vietnam in which many activists of my generation first got involved. And I have included two activists who helped organize today's mass peace movement in the United States, Helen Caldicott and Sandy Pollack. A special note is needed for Sandy who died at the age of 36 in a plane crash and who, as the eulogies in her book testify, was better known abroad than in the United States. She symbolizes a new and increasingly important aspect of the U.S. peace movement that may be said to have begun with Jane Addams, an internationalism that seeks to unify the peace and justice movements of the entire world. In considering the consciousness development of these great activists, it is not possible to separate the goal of peace from the goal of social justice. 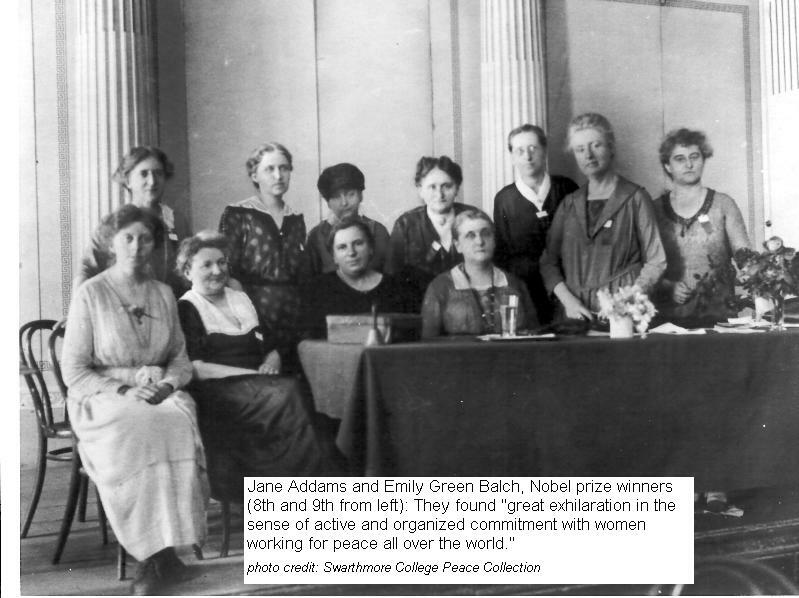 Jane Addams and Emily Balch won Nobel Peace Prizes for their work for peace, but each was involved in the movement for women's rights as well, and each began her consciousness development in social work on behalf of exploited people, including immigrant workers who came to America before the turn of the Century. 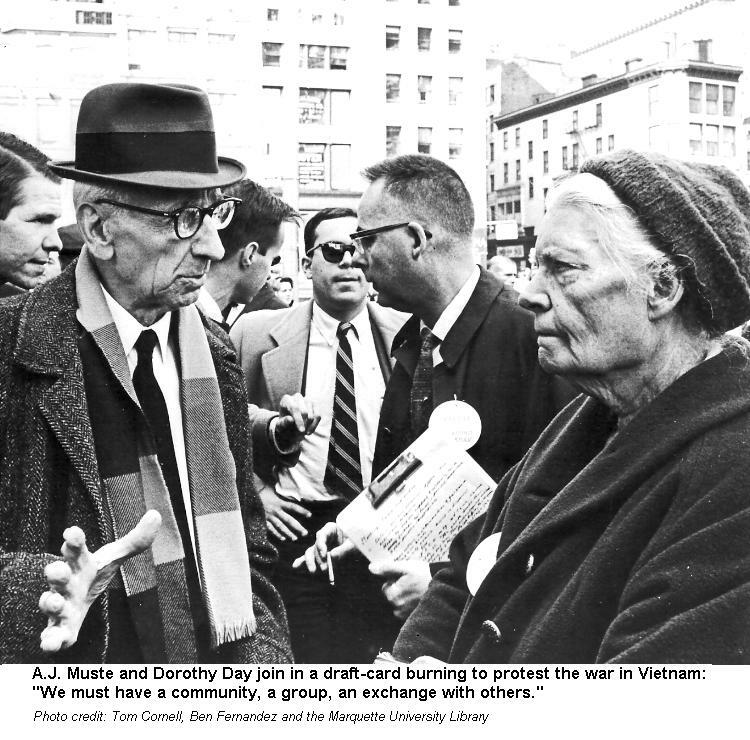 Dorothy Day and Bertrand Russell are best known as peace activists, but both began their activism on behalf of women's suffrage. Day was imprisoned for participating in a suffrage march in 1917, and Russell ran for British Parliament in 1907 on a women's suffrage platform. Day later founded the Catholic Worker Movement, and Russell, having become a world famous mathematician, philosopher, and writer, helped mobilize scientists' opposition to nuclear armament and later the CND and Committee of 100 for nuclear disarmament in England. Both W.E.B. DuBois and Martin Luther King, Jr. came to the peace movement by way of their struggles for civil rights. DuBois founded the NAACP in the first decade of the 20th Century and edited its publication The Crisis for many decades. And the journey of Martin Luther King Jr. from civil rights to trade union struggles to opposition to the Vietnam War and the Nobel Peace Prize is a well-known story.